A stronger economy has helped area shipping and logistics companies grow and increased freight prices and the number of orders for new trucks, a local business owner says. It’s a “perfect storm” for freight companies and the trucking industry, said Kevin Burch, president of Dayton’s Jet Express and the American Trucking Associations immediate past chairman. “Tonnage is up. And the amount of drivers is down,” Burch said last week in between meetings in Washington, D.C., where he was talking with other ATA leaders about infrastructure reform. Springfield truck manufacturer Navistar is seeing the demand, judging by the company’s latest quarterly results. Jeff Sass, Navistar senior vice president of sales and marketing, said Navistar is enjoying a rise in net orders year over year. “We are seeing some strength in the market today,” Sass said. However, the medium-duty truck market served by the Springfield plant is more consistent than the heavier “Class 8” market where the strongest demand is felt at the moment. Navistar has seen orders for anywhere from 80,000 to 85,000 medium-duty “units” a year for the last three years, Sass said. “We anticipate this year is going to be in that same range,” he said. The medium-duty market is not seeing the “fluctuations” seen in the Class 8 market, he said. To continue the growth, companies are doing to need to find new drivers,” Sass said, echoing a concern Burch has talked about for years. Navistar finished the fourth quarter of 2017 with net income of $135 million, compared to a fourth quarter 2016 net loss of $34 million. Revenues in the quarter rose by 26%, to $2.6 billion, compared to the fourth quarter last year. The manufacturing of trucks amounts to 64% of Navistar’s net revenue. Navistar makes and distributes Class 4 through Class 8 trucks, buses, and military vehicles. Complicating all this is a new federal rule that requires electronic devices that log drivers’ hours behind the wheel, Burch said. 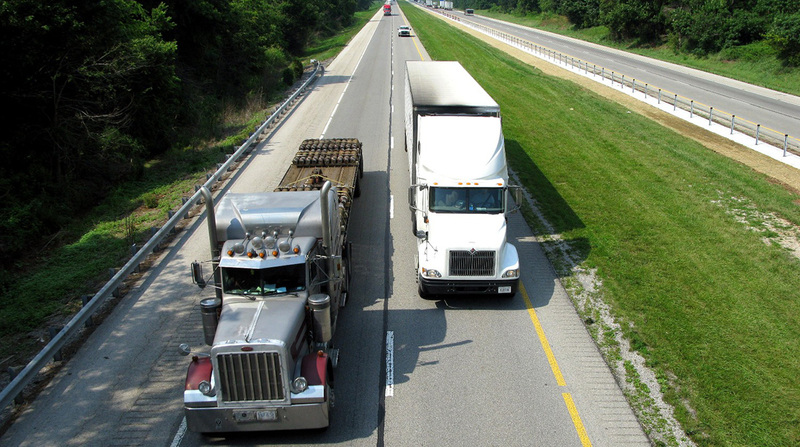 The rule took effect Dec. 18, and it could lead to more drivers idling their rigs, some operators fear. “We are going to need more drivers and more equipment on the road to handle the same amount of freight because of the ELDs (electronic logging devices),” Burch said. Trucking rates rose in September following hurricanes Irma and Harvey, and combined with a shortage in available drivers, freight rates rose quickly, according to an American Metal Market report published in November. The rise in freight costs was immediately felt on the “spot market” in the United States, which rose 23.5% between Sept. 1 and Oct. 24, to nearly a six-month high, American Metal Market said. Spot-market or quick service rates are more volatile than long-term shipping contract rates. From December 2016 to December 2017, spot market loads were up 86 percent while spot market capacity was down almost six percent, according to online freight marketplace DAT Solutions. The industry today is all about “rolling inventory,” Burch said. “We’ve got more and more people wanting freight that’s being produced in the morning and shipped during the day, and they want it that evening or the next morning,” he said.